Fishers Island Yacht Club in Fishers Island, NY has teamed up with the Storm Trysail Foundation to start a new junior overnight race. The inaugural event will start Friday, August 10, 2012. Each boat (27 to 45 feet) will be crewed by at least five junior sailors ages 13 to 18 and have one or two adult safety advisors aboard. The course will be 80 to 100 miles, touring either Block Island Sound via Point Judith, RI and Montauk, NY or Long Island Sound from Seaflower Reef to Stratford Shoal and back, depending on wind and conditions. The Fishers Island Overnight Race is open to all participants in an Eastern Connecticut Sailing Association (ECSA) junior sailing program, aboard boats either owned by a member of an ECSA member club or a community sailing program that is a member of ECSA. Several boat owners have already agreed to make their offshore-capable boats available to various junior sailing organizations. In the hands-on seminar, instructors will lead students through man overboard recovery drills, fire safety, heavy weather sailing, reefing, setting storm sails, weather observation, navigation and emergency communications. Upon completion of the seminar, students will receive a certificate given jointly by the Storm Trysail Foundation and US Sailing. 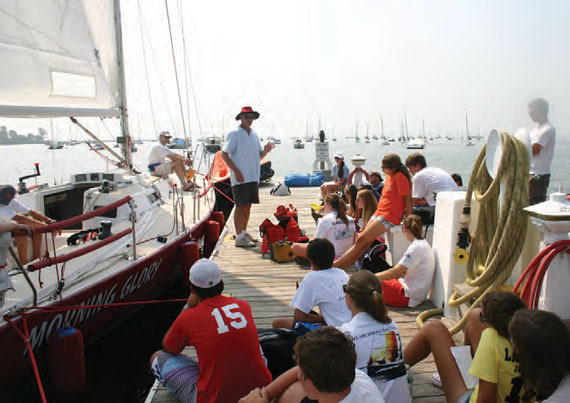 The Storm Trysail Foundation is running several other Junior Safety at Sea Seminars in the Northeast this season, including Shelter Island, NY, Larchmont, NY and Newport, RI, and students from those other venues are invited to field an entry for the Fishers Island Overnight Race. “The Storm Trysail Club and Foundation have been running safety at sea events since the mid 1990s,” said John Fisher, President of the Storm Trysail Foundation and Past Commodore of the Storm Trysail Club. “We realized that this is a great way to make all junior boating safer. In addition, these kids are learning the big boat handling skills that will help them become lifelong blue water sailors when they outgrow dinghies. Similar junior overnight race events take place in Western Long Sound and Newport, but this is the first time we have had a chance to support the creation of a new junior big boat race with a coordinated local seminar. We hope this will be a new model for growing safety seminars and junior big boat racing across the country.” For more information, visit stormtrysailfoundation.org and fiyc.net.